Here's a collection of some of our favorite hikes - many have easy access and offer easy to moderate walks into the woods or overlooking the coast, or longer trails if that suits you. EASY LEVEL - This walk among ancient redwoods and Douglas fir gives you an intimate look at a magnificent ridge-top redwood forest, with its complement of under story plants. Easy one mile loop. EASY, MAY HAVE TO HOP A LOG - Imagine walking through a narrow canyon where the walls are completely covered by luxuriant ferns and mosses and are dripping with moisture. That describes Fern Canyon, an unforgettable natural wonder that Steven Spielberg chose as a location for Jurassic Park 2: The Lost World. EASY LEVEL Trailhead: Marked trailhead is in the Big Tree Wayside parking area. Trail can also be accessed via Elk Prairie Trail and Newton B. Drury Scenic Parkway, across from Prairie Creek Visitor Center. Mileage: 1.4 Difficulty Level: Moderate. Description: This short walk gives access to some of the largest trees in the Prairie Creek area. Many cathedral trees, or a family group of trees, tower on the slopes. Walk past fallen mother trees that have become nursery logs for a vast array of trees and ferns. A great trail for children because of its gentle grade and many trailside herbs and berries. EASY Tralihead begins at Lost Man Creek Picnic Area. First 1/2 mile of this 2-8 hour hike is a gentle stroll ideal for families, people with disabilities, and elderly visitors. Bicycles welcome. This is a moderate trail with non-level grades. EASY LEVEL - This is a well-graded three-mile dirt road, little to no traffic. It's a winding road through old-growth forest in Prairie Creek Redwoods State Park. Located north of the Prairie Creek Visitor Center on Newton B. Drury Scenic Parkway. MODERATE with some steep grades. One of the newer trails in the park, this route is more notable for its noble redwoods and proximity to the Prairie Creek elk herd than for its small waterfall and scattering of trilliums. A springtime visit, with all four features present, is perhaps the best time for this hike, but it offers enjoyment—only a half mile from Highway 101—year-round. EASY Hwy 101 access road *(CLOSED to motor vehicles til further notice, still open to hike & bike) to the Skunk Cabbage Section, Coastal Trail, 1.7 miles north of downtown Orick. Easy hike past giant Sitka spruce and a stream canyon filled with skunk cabbage DISTANCE: 2.8 miles round trip (longer option available). MODERATE 10-mile (16-km) round trip hike through prairie. Take the Bald Hills Road to the Dolason Prairie Picnic Area. This is an all-day hike with some steep grades and switchbacks through open prairie country. Check out a historic Dolason sheep barn along the way. 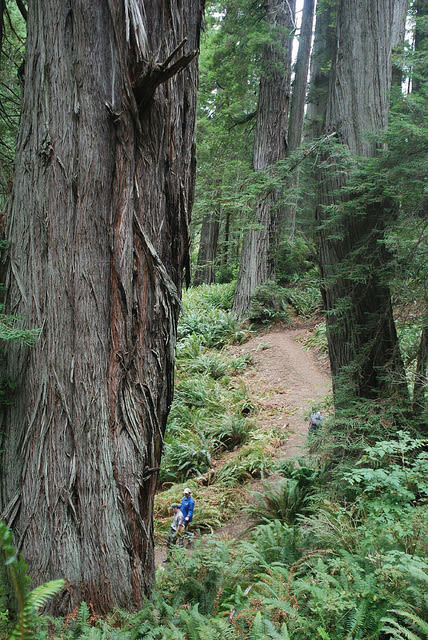 The trail gradually descends into the Redwood Creek drainage through old-growth and second-growth redwood forests. This trail connects with the Tall Trees Trail. Bring your own water. MODERATE TO STRENUOUS The first 1.5 miles are accessible. Here you can combine hiking and backcountry camping. Take an eight-mile hike to Tall Trees Grove, where some of the world's tallest trees grow on the flats of Redwood Creek. This involves two creek crossings. Caution: Bridges are provided in summer only. During the rainy season, high waters make stream crossings dangerous. STRENUOUS - Trailhead is located at the end of the gated Tall Trees access road (off of Bald Hills Road), accessible via free permit from the Thomas H. Kuchel Visitor Center on Hwy 101 south of Orick. Visitors are invited to hike in from the Redwood Creek trailhead, located just north of Orick, CA, on the Bald Hills Road. 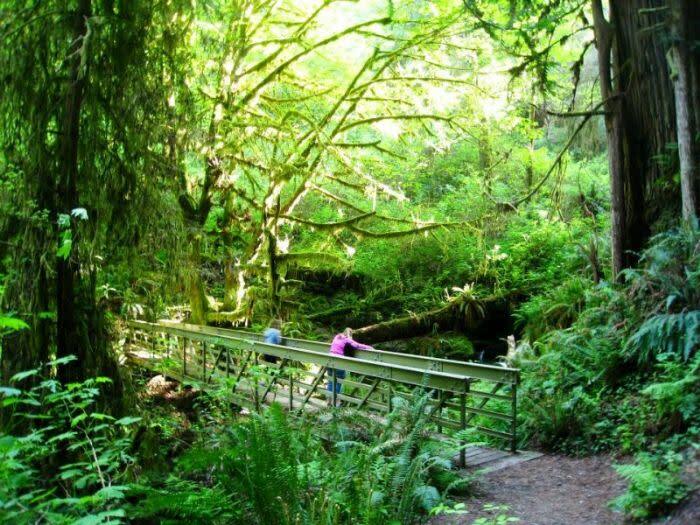 The 8-mile, one-way hike to the Tall Trees Grove is best accessed during the summer months when footbridges are in place to cross the creek. Permit is required for the Tall Trees Grove. Backcountry camping with permit allowed on the gravel bars along Redwood Creek. MODERATE - STRENUOUS 7.2 mi round trip · climbing 1270 ft. 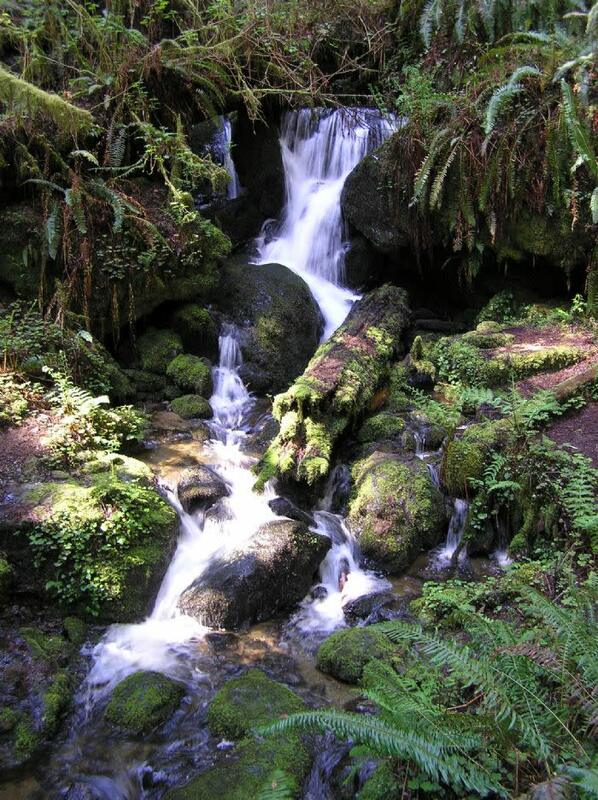 Hike from Prairie Creek Redwoods State Park all the way to Lady Bird Johnson Grove on this well maintained trail. If you start at Elk Meadow, the trail is uphill all the way, from where it crosses the highway and includes some steep switch-backs until it ends in the Lady Bird Johnson Grove. (3 mi.). EASY 10 MILES ROUND TRIP The Irvine Trail runs northwest, following the gentle drainage of Godwood Creek, named for an early homesteader. 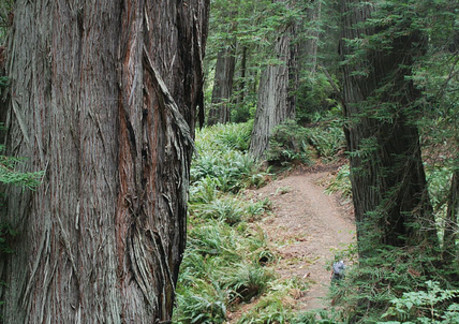 Ancient redwoods stand along the trail. Some reach diameters of 18 feet. Hike begins at Prairie Creek Redwoods Visitor Center. Loop back around to the beginning or take one of the offshoots to Gold Bluff's Beach or Fern Canyon. Looking for a quick "redwood fix" and only able to stay for the day? Park at the Visitor's Center in Prairie Creek Redwoods State Park, on the south end of the Newton B Drury Scenic Parkway and look for the trail head to the Prairie Creek Trail. Or drive Bald Hills Road to the Lady Bird Johnson Grove. Refer to Prairie Creek map in sidebar. This beautiful trail takes hikers through the Headwaters Preserve, a politically-debated old growth forest near Eureka, CA. This beautiful forest is a rare treat for visitors to explore. Our coastal trails are a wonderful opportunity for visitors and hikers to experience the rugged beauty of our coastline. Hikers can see a variety of birds and wildlife from these trails such as sea and shore birds, sea lions, harbor seals and whales. Most of these hikes are gentle to moderate. There are a variety of hiking trails at California State Parks that are accessible to people with disabilities. 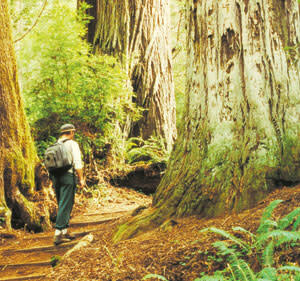 If you are looking for a guided tour of the redwoods please visit the Things To Do: Tours & Guides section.